This entry was posted on November 25, 2008 at 12:32 am and is filed under Fashion and Beauty, Politics, Race and Culture with tags Allison Samuels, beauty, Beyonce, brown skinned, Dorothy Dandridge, good hair, Halle Berry, Lena Horne, Michael Shaw, Michelle Obama, Newsweek, The Meaning of Michelle, vogue. You can follow any responses to this entry through the RSS 2.0 feed. You can leave a response, or trackback from your own site. I am sooooo happy that Michelle is a beautiful brown sister too. My dad and I commented on that, with glee, over a year ago. The fact the Barack married a woman “of color” who he is crazy about made us want to vote for him even more. He shows the world that she is a lady and she is desirable and she do not fit the mold. I am not dark but I have always hated and resented “colorism” within our race. My 7 year old daughter is dark, with rounded featured and absolutely gorgeous! My parents taught my sisters and me that color holds no intrensic value in who or what you are. I am teaching my sweetie the same. She is a princess and deserves to be treated as one. She is not spoiled or arrogant. She is kind and loving and has a quiet confidence about herself. That is what I see in Michelle Obama. I pray that many other girls and women will learn that from her. My dad said after the election, “maybe because of Barack and Michelle black men will start valuing and marring black women again.” Amen Daddy. 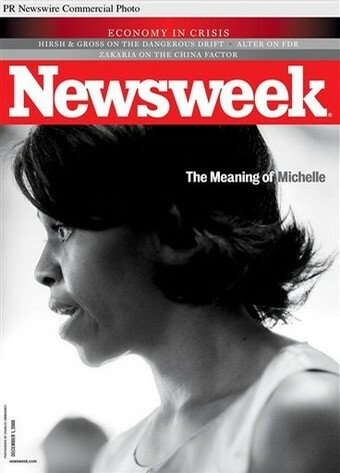 I have loved your articles about Michelle Obama–and Newsweek’s prominent coverage of our First Family. Great work. It feels SO good to read these insightful and positive articles! Know why the majority of magizines have white folks on the cover to accompany articles written by white folks to be read by anybody with green money are this way? Know why the few magizines who have minorities on their cover written by anybody for the hip-hop generation only to read are this way? Answer is the same because of the owner. Stop blaming the white people. If we want more of us on the cover– then we need our neighbors with lucrative residual income to invest in our neighborhoods. We need publication companies not just record label! We need them open business other than a franchise– the ultimate pyramid scheme. We need them to hire qualified people to take the business to the next level, not just hire their home boys, baby mommas, and booty calls. If we want the world to take us serious, like they take President and First Lady Obama– then we need to all follow in their shoe steps. Take notice of their comand of our lauguage, how they handle conflict, how they have each others back, how their public and private images are similar, how they cause no drama, but do swiftly end it. I do not know too many big Mommas like Mrs. Michelle Obama. The ones I know try to party with and dress like their kids, and a few even want to sleep with their kids friends and smoke weed with them too. Thank goodness the Obamas are reminding all of America, not just black–or whatever word makes your fragile ego feel good– but, all people of the world, to embrace these positive people that generate hope and goodwill, with their high standards and morals. ITS not the color– but the content! Some of you maybe surprised at the true demographics of DC. Just visit. It was this way prior to the Obamas. Our forefathers invented and accomplished much. They work with their hands and back to culivate dreams to reality. Lets not loose that power of accomplishing through hard work with our hands. No one helped the, or gave them instructions, or a cheat sheet. They imagined and created! Most millioniares all work with their hands and on their feet! Doctors, lawyers, dentist, speakers, actors, ranchers and farmers (yes farmer are muli-millionaires!! ), chefs, professors… rappers… profession NFL, NBA, MLB, and NHL athletes… and who ever else— they work! The cream rises to the top–and history is wrote.